The portfolio manager of this PIMCO fund is Chris P. Dialynas. He started managing it since its inception in June 2008. The fund’s expense ratio is 1.30% per year. This PUBAX fund also has 0.25% management fee and 3.75% front-end sales load fee. The total net assets are $ 15.08 billion. This best rated bond fund also has a dividend yield of 1.94%. The annual holdings turnover as of September 2012 is quite high 1,001.00% compared to the category average, 168.97%. The fund’s average duration is 0.24 years. 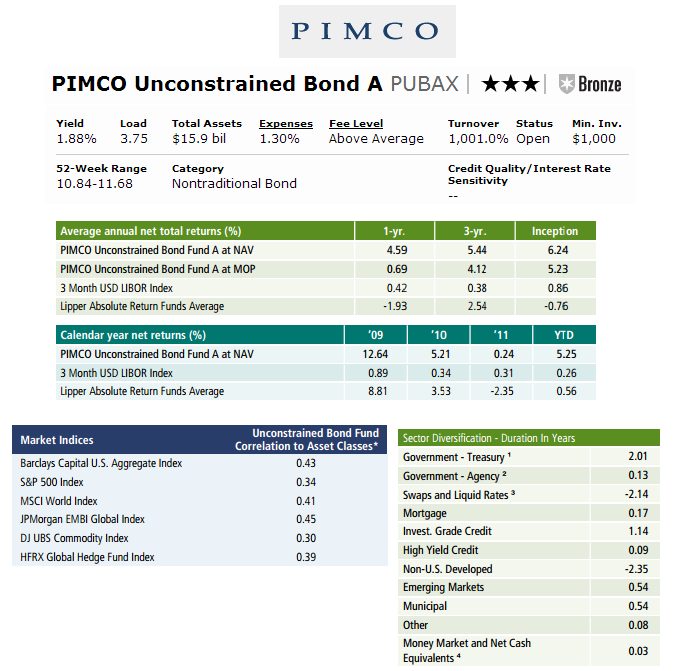 This Nontraditional Bond fund has been rated with 3-stars rating by Morningstar. It also has Bronze rating. Since its inception, this fund has always recorded in positive return. The best 1-year total return was recorded in 2009 with 12.64%. It has returned 3.44% over the past 3-years and 2.85% over the past year. The fund’s benchmark is Lipper Absolute Return Funds Average. The other classes of this fund are Class C (PUBCX) and Institutional Class (PUBRX). You will need $1,000 minimum initial investment to invest in this fund in regular brokerage account. There is currently no retirement (IRA) account available. 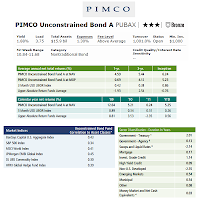 There are around 68 brokerages which offer this PIMCO fund, such as Firstrade, Vanguard, JP Morgan, Ameriprise Brokerage, Fidelity Retail Funds Network, Raymond James, JP Morgan, Merrill Edge, etc. Investing in mutual fund involves risks. The principal investment risks include interest rate risk, credit risk, high yield risk, market risk, issuer risk, liquidity risk, derivatives risk, equity risk, mortgage-related and other asset-backed risk, foreign (non.U.S) investment risk, Emerging markets risk, currency risk, Leveraging risk, management risk, short sale risk, etc.